In addition to his pastoral leadership in the church courts, the fourth college to be established in the colonies was the College of New Jersey in October of 1742. It began in the manse of the first president, namely, Jonathan Dickinson. The handful of students in what later on become Princeton Theological Seminary and Princeton University studied books which were a part of Dickinson’s pastoral library, and ate their meals with his family. He would pass on to glory four months after the beginning of this school. President Dickinson died on October 7th, 1747, of a pleuratic attack, at the age of 60. The Rev. Mr. Pierson, of Woodbridge, preached at his funeral. Dr. Johnes, of Morristown, New Jersey, who was with him in his last sickness, asked him just before his death concerning his prospects. He replied, “Many days have passed between God and my soul, in which I have solemnly dedicated myself to Him, and I trust, what I have committed unto him, he is able to keep until that day.” These were his last words. It is said that when tidings of Mr. Dickinson’s disease came to Mr. Vaughn, the Episcopal minister of Elizabethtown, who was then lying upon his own death-bed, that he exclaimed, “Oh, that I had hold of the skirts of brother Jonathan!” They entered upon their ministry in the town about the same time, and in their death they were not divided. Cameron, Henry C., Jonathan Dickinson and the College of New Jersey, or The rise of colleges in America; an historical discourse delivered in the First Presbyterian Church, Elizabeth, Sunday, January 25th, 1880. Dickinson, Jonathan, Familiar Letters on a Variety of Seasonable and Important Subjects in Religion. _______________, Testimony Concerning that Faithful Servant of the Lord, Robert Barrow. 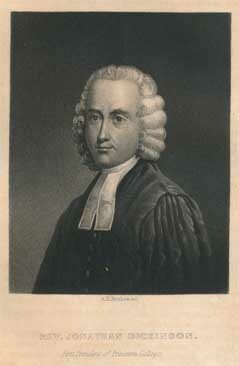 Le Beau, Bryan F., Jonathan Dickinson and the Formative Years of American Presbyterianism. Lexington, KY: The University Press of Kentucky, 1997. Sloat, Leslie W., “Jonathan Dickinson and the Problem of Synodical Authority,” The Westminster Theological Journal, 8.2 (1946): 149-165. “It should be noticed that the form of the original act of subscription differs from that in current use among Presbyterians. Originally ministers declared that they adopted the “said Confession and Catechisms as the confession” of their faith. The present form is that candidates “receive and adopt” the Confession “as containing the system of doctrine taught in the Holy Scriptures.” Hodge appears to argue that these two are substantially the same, and that what is involved is subscription to a system of doctrine, which system is Calvinism. The subscription, in other words, is not to the ipsissima verba [i.e, the very words] of the Confession, nor merely to the Confession “for substance of doctrine,” but to the system of Calvinism. While we are prepared to agree that that is the significance of the current formula of subscription, we are inclined to feel that the original form, in which the Westminster Standards were made “the confession of our faith,” suggests a much closer adherence to the words of those documents. Today a congregation which in public worship “makes confession of its faith” by repeating together the Apostles’ Creed, does not understand that it is asserting merely a system of doctrine, but rather adopts as its own the language of a document whereby it expresses its faith. So it seems to us that the Synod was originally not only adopting a system of doctrine, but was also adopting a form of language, for which reason it was necessary at the beginning to eliminate or interpret language concerning which some scrupled.